It was bad enough to be an apologizing Republican, now I have to be an apologizing Christian too? Good God Almighty (pun intended) people, what the hell has gotten into you? You’re offended with the Starbucks holiday cup because it doesn’t say Christmas to you, so you have declared that Starbucks is “waging war” on Christians? I can hardly stand the idiocy of it all. I am assuming that the Christmas ornaments, snowflakes and snowmen of previous Starbucks cups just screamed the celebration of Jesus’ birth. No? Yeah, I didn’t think so. We are in trouble here. At what point did we, as a society, start demanding that everything be done our way and conform to our beliefs? When did we become such whiners? And since when does a coffee cup escalate to a belief? Who do you think you are to pass judgement on a corporation for choosing a color for their disposable coffee cups? Don’t we have plenty of real problems in this world that you should be focusing on? Get upset over the homeless problem we have here in America, ISIS, beheadings, the random bombing of commercial aircrafts, racism, student loan debt, gun violence, wealthy idiots who pay thousands of dollars to kill endangered species, global warming, polluted oceans, a nuclear Iran, and the slaughter of countless marine life. And that’s just for starters. Instead, you have chosen to speak out about a red paper cup that is “assaulting Christian beliefs”. Cry me a river! It isn’t Starbucks who is of ill faith, it’s you. I’m quite confident that Jesus would not have had an issue ordering his holiday latte and receiving it in a red cup. And neither should you. 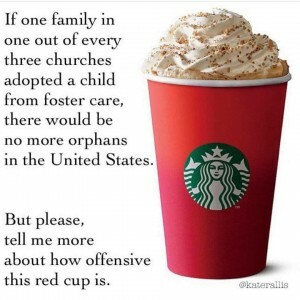 I hate to break it to you, but if you need a decorated coffee cup to celebrate your Christianity and substantiate your faith, then, my friends, you have far bigger problems than a little red cup. Stop embarrassing yourselves (and me) and try very hard to remember that as Americans we hold dear the right to freedom of expression and opinion. Starbucks is not here to cater to your faith your way. Get over yourselves. It is this writer’s opinion that those of you drumming up hatred over a little red cup are anything but good Christians. Maybe it’s time you started drinking your coffee at home, you know, right before you go to church. The reason for the season would be very ashamed of you. Evette Goldstein - Once again, you are right on Tammy! I truly wish being reasonable and intelligent with a sense of what is important (as well as a sense of humor) were contageous! T.O. Weller - You know, I had no idea what people were talking about yesterday. Suddenly posts about coffee cups, what’s really important in the world, and Christmas were popping up all over my news feeds. When I found the root cause, I couldn’t believe it. Really?!? We talk about the extremists in other countries like they’re so frightening, like they must be stopped at all costs, like they threaten our very safety and security … is this not just a little extreme?!? I also wonder … every country, every religion, every family, typically has at least one person or group who sees the world in a strange and sometimes twisted way. I grew up with the idea that it was best to politely ignore them and not let them bother me nor give them the fuel to continue. When did such insanity become the sort of thing to go viral?!? Laura Lee Carter - Yeah Tammy! We have turned into a nation of silly whiners, who have no idea how some suffer while we whine about the color of a cup. I wish to see as much outrage over the fact that 500,000 Americans in midlife (age 45-54) have killed themselves in the past few years, because they couldn’t see any reason to go on. Or how about the veterans who are killing themselves at an alarming rate. Michelle Poston Combs - awesome! shared! Kathy Gottberg - Good for you Tammy! I think the more of us that stand up against such silliness the better. I KNOW lots of very devote Christians who LOVE Starbucks (or at least they did until a few groups started making this their “latest” devil) who know very well that Starbucks sells a very popular Christmas Blend each and every year. That doesn’t sound like an organization that is against Christmas????? But some groups will do anything to find a “rallying point” even if it is a false on, and I surely think this is an example. Thanks for calling them out is such an elegant way! Carmen - Amen. Amazing that as Christians we believe we are created by GOD…that includes an incredible “brain”. We are misusing our God given brain! Rael Hall - Apparently we have not yet learned how to get along. I am grateful that I get my coffee in a cup, not in a cupped hand. Discrimination and Judgment over the color of something is not unconditional love. Whether it be a coffee cup, or a human body, we must look within and see beauty,positive potential, and accept diversity and individual choices as each piece of the pie is still pie and cannot harm us. Carol Horowitz - Nailed it!! Love your wit and writing Tammy. Btw, that’s your, not you’re. Kimba - “Don’t we have plenty of real problems in this world that you should be focusing on?” BINGO. I swear when this comes up in tonight’s debate, oh and you know it will, my head is going to explode. Judy Carpenter - Thank you. I am often amazed by the things people get upset over. As opposed to the things they should be upset over(hunger) and aren’t. Demi Seres - Unfortunately Starbucks seems to be that which was the watercooler in offices oh not so long ago. There is more socializing along the remnants of emptied strewn half sugar packets and gallons of spilled coffee in the trash than a decent conversation of opinions in the workplace. This is where people are throwing down the gauntlet and it is pitiful! I agree make your coffee at home and smell the real problems in life. Act like a Christian and use your energy to solve problem not create them! Tammy - I am offended at least twice a day, T.O. I shrug it off and move on. But this stuff is just plain ridiculous. And places such a black smudge on the word “Christian”. I mean, really! Hard to believe that people follow this kind of thinking. Scary to think about. Tammy - Thanks for the support, Laurie. Grateful for the read and the comment! Tammy - Point well made, Laura Lee. It’s all so crazy and I’m so over it. I know that many peeps don’t agree with me, but all I’m really asking is for people to be reasonable about things. Is it really that hard? Geesh! Tammy - Hi Carmen, I can’t explain this phenomenon. I am at a loss. There is always someone standing on a soap box uttering stupid stuff. But to have so many jump on the Stupid Wagon and have the media propagate it, well, it’s beyond crazy. You’re right….we need to use our brains. As to what’s next…I shudder to think! Tammy - I hadn’t thought about tonight’s debate. Oh, God, I’m right there with you…outrage will pour out of every pour of my body should this subject come up. I can barely stand the stupidity of the followers of this new spotlighted non-issue. God help us all! Laurel Regan - Very well said! Thank you for standing up and speaking out against this lastest form of lunacy. Tammy - Hi Demi, they ARE throwing down the gauntlet (love that phrase)! And it’s beyond insane. Either someone is serving some pretty strong Kool-Aid or people area walking through life with blinders on. Either way…scary stuff! Thank you for the read and the comment! T.O. Weller - I hope you didn’t misunderstand me … I wasn’t perplexed by your post, but more by the way this coffee cup story became so big in the first place. I understand why you responded — it needs to be done when it gets to this point. As you say, it’s ridiculous. 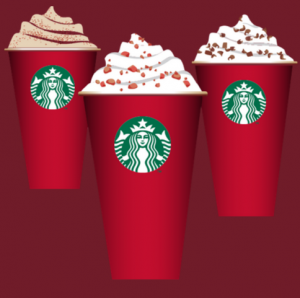 Mary Lanzavecchia - Like you, I am disgusted that a red cup became a battle cry for a collection of Christians. And, like you, I wrote about my disgust. My hope is the tides are turning and the backlash will take root and spread far faster than the silly message a red cup declares war against Christmas. Tammy - I totally got you and so appreciate the share! Perplexed is a good way to put it. Followed by outrage and the idiocy of it all. Good grief! Tammy - Hi Mary, a cup as a battle cry … how crazy is that?! I enjoyed your sharing and the memories your brought forth. There is a reason for the season, and it has nothing to do with a coffee cup! Carol Cassara - I love that we are all getting really fed up with this crap. Word! Melanie Kissell - Just goes to show how petty some people can be. You know what I say? GET. A. LIFE. Better yet, work to improve the lives of others! It astounds me the time and energy people devote to ignorance and idiocy. Joan Salamone - You are a great writer, Tammy Bleck, and you hit the nail right on the head, there are some real idiots in this world. Connie McLeod - I agree! It’s just gotten ridiculous. Anne Tichauer - Tammy, you nailed it again! Always a pleasure reading your articles. Susan Melchiori - I personally knew nothing of this until today. To hear about it, then to read your column, Right on Tammy!!!!! I think I need to go to Starbucks and get me a red cup o Joe! Jeffrey Davidson - As always, beautifully written! Unfortunately there are too many other problems in this world that are far more important than the color of a coffee cup. Continue promoting to enlighten people and hopefully they will learn to think better. Tammy - I am going to Starbucks later tonight, Susan. When they ask my name I’m going to say “ChristianLovesYourCups”. BUAHAHAHAHAHAA I was born a rebel. Appreciate the read, thanks for that! Tammy - Thanks, Jeffrey. Happy you enjoyed! If only it were that easy. Happy to see you here, my friend. Cathy Chester - I love Christmas. I love everything about it. Starting in November I listen to Christmas music on the radio. I watch Christmas specials and own Charlie Brown’s Xmas and Mr. Magoo’s Xmas Carol. I love Christmas films. I even love midnight mass because of its beauty. I love reindeer, the lights and Rockefeller Center in December. Did I mention I am a Jew? Yup. I am a spiritual person too, and this ridiciulous conversation is so silly. Oy, vey! Let’s move on to something more important, eh? Not being Christian might disqualify me from commenting? You think? Naah. What a funny, passionate, witty column, loved it. I like the season, the carols (see Pentatonix version of “The Little Drummer Boy”)and proclaim your right to drink coffee in any cup you prefer. Lois Alter Mark - I’m so sick of this, I can’t stand it any more. The hypocrisy of these so-called Christians who keep demanding religious freedom is astounding. They only want freedom for their own religion, and it’s time to put a stop to their craziness. Ande Lyons - Thank You Tammy! You captured the whole fiasco and bundled it up into a frothing double shot of WTH. As usual you elegantly and eloquently wrote what many us were thinking… whew… LOVED. EVERY. WORD. A delicious conversation has begun – blowing you kisses filled with appreciation, love, Peace on Earth and Joy to the World! Carolann Iadarola - Poor Starbucks. Honestly, they need to leave that company alone. Always being picked on it seems. I too am fed up…it’s all nonsense. You said it best. A cup doesn’t define a person’s Christianity. Debbie McCormick - Agreed, but let’s put this in perspective. I am a Christian and couldn’t care less about the cup. The media has jumped on the few complaining about this and turned it into a big mess and given Christians who are level headed a bad name. I think the people compaining about this are ridiculous. And most Christians feel the same way. Don’t let a small percentage of people the media is focusing on turn this into something it isn’t. Estelle Sobel Erasmus - I agree with you. This tempest in a teacup (ok coffee cup) is really silly. Todd Montgomery - I like the color RED! For ny birthday on the Fourth of July I like red cups. Tammy - Cathy, you crack me up. Many Jews love the season and many Christians love Hanukkah. I am marrying a Jew and we observe Shabbat more often than not. Yup, this conversation is an insult to intelligent people everywhere. I’m with you….let’s move on! Tammy - Hi Mel, let’s order up a couple cups of java in red disposable cups and solve the worlds problems, shall we. Would welcome the opportunity. This topic, however, would be on the bottom of the list. As always, wonderful having you here! Tammy - Some people have more time than brains, although I can’t quite figure out how. I agree, Wendy. Stupid is as stupid does! Tammy - Luke, I’m familiar with the hymn but clueless about the dress. Debbie Wells- DeRosier - Dont like the cup? Slap a sticker on it. Marie Baer - Spell check…..
Lydia Gibson - Very well said!! Christine McQueen - Very well said! I don’t get away frome Facebook too much, but I’m glaf I took the time to come here and read this! Sean Faust - NAILED IT! Jane Harms - Finally! Someone willing to tell it like it is. Let us all “get over it” and focus on consequential issues and let go of the inconsequential nonsense. Enough is enough. Tam Warner Minton - I LOVE Christmas, but I am a secular and culture Christmas person. I like to light the mennorrah, too. According to the right wing, Christianity is under attack. Right. Whatever. Jean Avallone Chasmer - Its not that its just a little bit of nothingness to be upset about – it is just one more slowl creeping up of getting rid of all things Christian – I personally will not be going to Starbucks! Richard Mignone - beautifully expresso d! Daryl Allen - I’m so tired of the issue that Starbuck doesn’t have a Christmas cup. All we are doing is given them free advertizement. I don’t drink Starbucks Coffee or go to a Starbucks store. I don’t encourage any one to buy their products and i would rather go to McDonalds or RaceTrac to buy Coffee. At least they are not goint to get into my pocket and charge me over $3.00 for coffee that i don’t think is worth more than $1.69. Karen S Williams - Well said! Carol Randle Sinatra Rapp - I agree totally—-except I guess I’m an apologizing democrate. Get real out there you supposed Christians. Catherine Mulholland - Yes !!!!!! Empty Besters - It is about the spirit of the time. It has not been commercial free since the Romans got hold of the pagan festival that turned into Christmas. Be good to each other and forget about the coffee cup, except to wonder if theyare being recycled properly. Judith - It is about the spirit of the celebration. It has not been commercial free since the Romans got hold of the pagan festival and turned it into Christmas. Be good to each other and forget about the coffee cups, except to wonder if they are being recycled properly. Tammy - I could NOT have said it better myself, Judith. THANK YOU! So happy to have you here! Tammy - It seems to be a time in history well all kind hearted, politically smart minded people are apologizing. We should ALL get REAL! Thanks, Carol!! Tammy - Thank you, Karen. Appreciate the read! Tammy - One of the many, many reasons to love America: freedom to make your own choices! And it was Starbucks choice to use a simple red cup. Respect goes both ways. Regarding the coffee, Starbucks isn’t for everyone! Tammy - Thank you Richard. Appreciate the read! I agree with you. Well-written as always. I hear you are speaking at CSUN again. How can I become a motivational speaker about blogging? How do I get on a list?